Try to walk by an unfinished jigsaw puzzle without stopping. It’s almost impossible. In fact, nearly half of all Americans puzzle for fun, to relax, or to relieve stress. 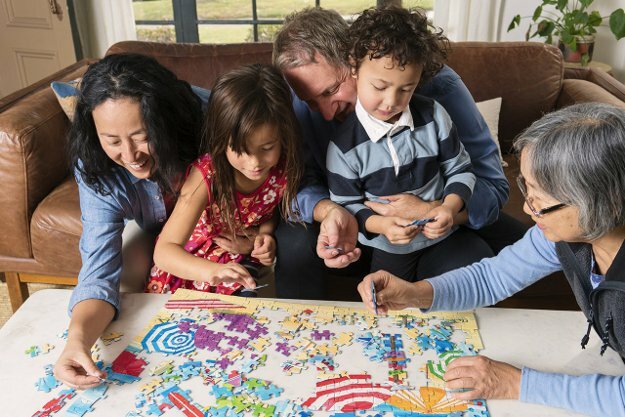 Families puzzle together as a winter tradition; millennials puzzle to connect with each other and disconnect from a hyper-digital lifestyle; while seniors puzzle for a brain boost. The first jigsaw puzzle. Engraver and mapmaker John Spilsbury is credited with inventing the first jigsaw puzzle in 1767. He drew a map on top of a piece of wood, then used a jigsaw to cut it into small pieces. The name clearly stuck. Kids today still learn geography by using jigsaw puzzles of maps. In fact, the "Geographical Puzzle" was the first wooden puzzle produced in 1891 by Ravensburger, the world's leading puzzle-maker. A puzzling craze sweeps the nation. Puzzles for adults became popular around 1900, and by 1908, they were a staple of the upper class. Why the upper class? Wooden puzzles were expensive, typically costing $5 each (or $140 today). For working people, who earned an average of $50 per month, puzzles would have been a luxury. Over time, cardboard puzzles became a less expensive option. Puzzles grew. Literally. In 1977, Ravensburger debuted the world's largest puzzle for its time, with 5,000 pieces. Today, the world's largest Disney puzzle, dubbed "Memorable Disney Moments," clocks in at 40,320 pieces. It took the puzzle creators 650 hours to trace each of the 10 scenes by hand to be digitally rendered on the computer, and another 400 hours to bend the steel sheets with a hammer to create the cutting tool. To learn more about jigsaw puzzles, visit Ravensburger at https://www.ravensburger.us.